Badam or almond burfi recipe - Deepavali festival and faral is incomplete without laddus and burfis. Among all burfis, cashew nut burfi and almond burfi are my favorites. 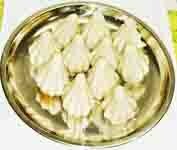 This most in demand burfi is available in mithai (sweet) shops. But homemade sweets have emotional touch that served with much pride. In homemade sweets purity of ingredients and the cleanliness is guaranteed. I have already posted badam laddu, that is prepared with almond khava mixture. 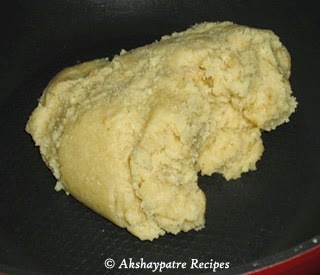 The preparation of almond khava mixture for both laddu and burfi are almost similar. Smart idea is that, to prepare both laddu and barfi at a time, prepare more quantity of almond khava mixture, divide them into two equal portions, then use one portion to prepare laddu and another one for burfi, I did the same thing. 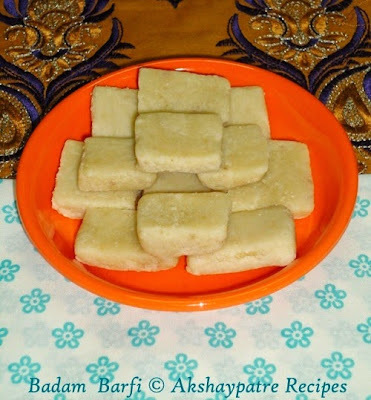 The only difference between the preparation of laddu and burfi is that to achieve a smooth layered attractive burfi, the almond mixture has to be smooth. 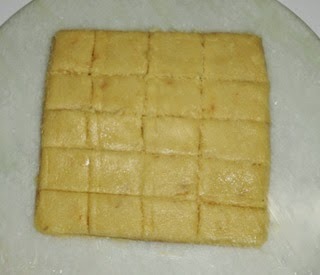 To prepare burfi, the mixture has to be rolled to a thick round disc, trimmed to square, then cut burfi into squares. 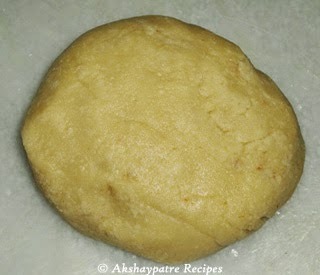 I have used the almond khava mixture which is prepared for badam laddu. So, I am not posting the same thing again. Once the mixture turns to lump, remove from heat. Divide it into 2 eaqual portions. When the mixture is warm, roll it to a thick round disc on a chapati board. Trim the sides and give a square shape. When it comes to room temperature, store in an airtight container. It can be stored for 10 days at room temperature. If kept in refrigerator, it can be stored for over a month. 1. I have used the almond khava mixture, which is prepared for badam laddu. 2. Once the mixture turns to lump, remove from the heat. Knead it to soft and smooth. 3. When the mixture is warm, roll it to a thick round disc on a chapati board. Trim the sides and give a square shape. 5. When it comes to room temperature, store in an airtight container. It can be stored for 10 days at room temperature. If kept in refrigerator, it can be stored for over a month. 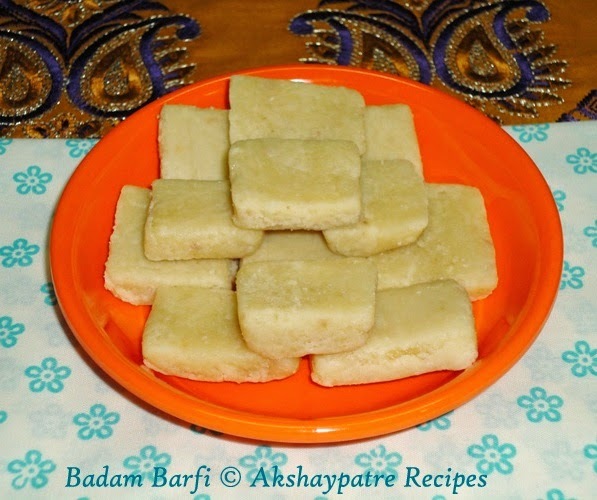 Badam Burfi looks super delicious.